The natural plant life and vegetation of Darjeeling is climate and altitude dependant but varied. As the climate varies throughout the year so does the flora. The dullness of winter disappears with the dawn of spring during the month of March and April. The Spring season is short but gives the town a rich colorful look. The Rhododendrons cover most parts of the hill station during this time of the year (March - April). There are 24 species of Rhododendrons in the hills of Darjeeling. The flowers are of different colors, scarlet, mauve, white with a tinge of rose. The most commonly found species is called Lali Gurans among the locals due to its red petals. Some species of Rhododendrons have flowers which have a variegated appearance. Some are in the form of small shrubs with pink flowers. Rhododendrons are known for their medicinal properties and are regularly used by the locals for this purpose. The Magnolias and the Michaelias also bloom during Spring. You can see dark pink and wine colored cup and saucer shaped flowers hanging from low leafless branches. The Magnolias are eye-catching and imparts a picturesque look to Darjeeling town. In the months of April - May small white flowers of Peach and Pear bloom. The first sign of red cherries are also seen around this time. This edible fruit is the locals delight. Most of the houses of Darjeeling cultivate Orchids during this time of the year (April to May). This flower can be grown from cuttings. The orchids are golden, silver, pink, white and purple. At times potted orchid plants are also seen. Cymbidium, a variety of orchid is worth mentioning as this is imported from Holland and Australia and finds a place in Darjeeling hill town. You will often get to see freshly cut flowers as table decorations in the restaurants and home stays in Darjeeling district. Around the festival month of Durga Puja and Fulpati in October the hilly regions of this district is flooded with white, orange, maroon and golden yellow Marigolds. This flower is used as prayer offerings. The Nepalis call Marigold 'hundred leafed flower' in their local language. In Darjeeling district, most part of the hilly region have the evergreen pine tree locally known as 'Dhupi'. The only coniferous plant is the 'Larch' in this hilly zone. Small bamboo trees are found in Kurseong, Kalimpong and Darjeeling. The species of bamboo 'Maling' is common in the forests of Darjeeling and interspersed among this are the tall oak trees, maple, chestnut, alder and birch. You can also find thousands of varieties of flowerless plants like mosses lichen and ferns. The ferns have medicinal value. Another species of trees the 'Betula' species is the only one found in the lower part of Kurseong town. Walnut and Pipli are found in the upper areas. The most common undergrowth of Kurseong subdivision are the lichens and ferns. Most part of the foothills of the Himalayas or the Terai region is occupied by the 'Sal' tree. Sal trees are very tall and sometimes reach a height of 30 meters. The resin of this tree is used in the preparation of detergents, astringent. Sal is also used for medicinal purpose. Winter (November to January) is the time for the oranges. 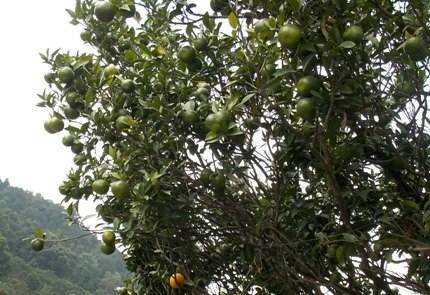 There are several orange orchards all across Darjeeling district including in Kurseong, Mongpu, Kalimpong and several other places. And oranges of Darjeeling juicy and sweet. They are smaller in size compared to what you see from places like Nagpur, have thinner skin and a bit pale in color, but when you consider the quality and sweetness, they are awesome. early October when they are not yet ripe. The exotic flora of Darjeeling makes this region very special. The rich variety of its flowers and vegetation proclaim that this is a naturally gifted hill station among the many in our country. Although surrounded by lofty mountains, this land is never barren and thus remains ever attractive to tourists all the year round.